Quilting and sewing classes for the beginner and advanced sewer. Get exclusive ruler kits and tutorials delivered straight to Big Sky Quilts each month! 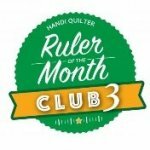 The Long arm Ruler of the Month Club is great opportunity to challenge your quilting skills and build ruler work confidence. Each month in the six-month series features a debut acrylic ruler paired with mentorship from your local shop, step-by-step video instruction and design ideas. Join Penny Getz,certified Kimberell Instructor, for this 4 day introductory Machine Embroidery Mini Retreat featuring Kimberbell Designs. Penny has been quilting, sewing and designing for more than 20 years. A few years ago she found a new passion and love in machine embroidery. She has training with Kimberbell Designs and Anita Good Designs as well as others. With over 3years experience as an educator she has a broad knowledge of machine embroidery. She stated It gives me great joy to share my knowledge and see the gratification when projects come together. I cannot wait to meet all of you. Meeting the 2nd Friday each month join other quilters bitten by the love of fabric bug to turn fabric into creative projects. Gift of the Month Club meets the 3rd Tuesday of each month. Need a gift for a family member, thank you to a person of just for a fun surprise? The Gift of the Month club meets the 3rd Tuesday of each month to create unique gifts.